You might recognise this five-button, wireless wonder from Microsoft's latest wireless desktop kit where it's bundled alongside the 2.0 version of its Wireless Keyboard 3000. There is no difference between that and the standalone version we have here apart from the all black trim setting it apart from the old-school grey and black, two-tone stylings of the mouse in the desktop set. There are five buttons, with the usual Microsoft software for button-mapping, though the placement of the forward and backward buttons being on opposite sides of the mouse makes navigation more awkward than if they were aligned on the thumb side only. The placement setup however does ensure that the mouse is totally ambidextrous, making it just as comfortable - or as awkward - for either the left or right-handed user out there. As I mentioned, when looking at the mouse as part of the kit, the scrollwheel and middle-button are the weakest points of this otherwise solid mouse. Clicking the scrollwheel down can often result in the computer registering that action as a movement rather than a button press, which can make browsing a bit of a hit-and-miss affair. That said the combination of Microsoft's impressive BlueTrack technology and the 2.4GHz wireless connection means that the mouse is otherwise very responsive indeed. The use of standard AA batteries means that there's no need for a charging stand and also adds a certain re-assuring weight to the device and means that it doesn't slide across the desk at the slightest breeze. 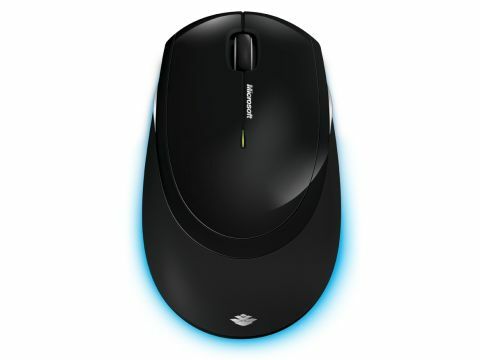 The 5000 then is a solid little mouse, perfect for the left-hander after an all-round device. That said if you're not a leftie, it's worth mentioning that both the Logitech G9 and Microsoft Sidewinder are available for less than £40. They're excellent mice and not just in the gaming circle.